Just got in from the beach? Whatever your style is, get beachy waves and the undone look with our Texture & Tousle range. The range consists of a shampoo and styling products to get a textured look with natural movement. 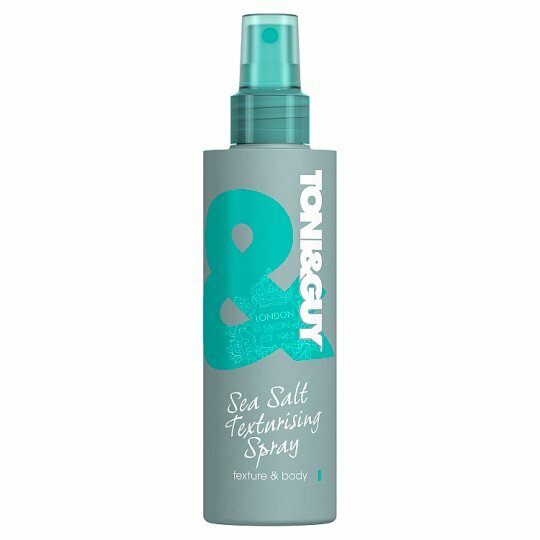 Our Sea Salt Texturising Spray is perfect for any matte textured looks. This product defines & separates to create tousled texture and light hold without a crunchy feel. It’s the perfect product for that beach look. Ready for some texture? Shake can and spray on dry hair from root to tip. Leave to set and work with fingers to create long lasting texture. Partner with Texture Detox Shampoo for the ultimate textured look. Born in London from a love of fashion, Toni & Guy products are inspired by catwalk looks and high street style, to create standout hair styles. Toni & Guy celebrates individuality, empowering you to express your style through hair and fashion and to create your look from the hair down. Looking for hair style inspiration? Check out our website toniandguy-products.com for professional tips on how to achieve salon inspired hair styles. Go to allthingshair.com for hair tutorials, trends and product recommendations. We would love to hear your thoughts! If you enjoyed using this product, please share a review.